1. Create a web proxy authentication policy for Global Proxy using NTLM — see Creating Authentication Policies. 2. Set the Global Proxy devices' internal proxy settings to point to the externally resolvable hostname of the Smoothwall (which resolves to the external IP address of the Smoothwall), and the port number used for the Global Proxy using NTLM authentication policy. 3. Add the external address of the Smoothwall to the devices' internal proxy exception lists. This ensures the certificate validation requests are not proxied. 4. Go to Web proxy > Global Proxy > Settings. 5. 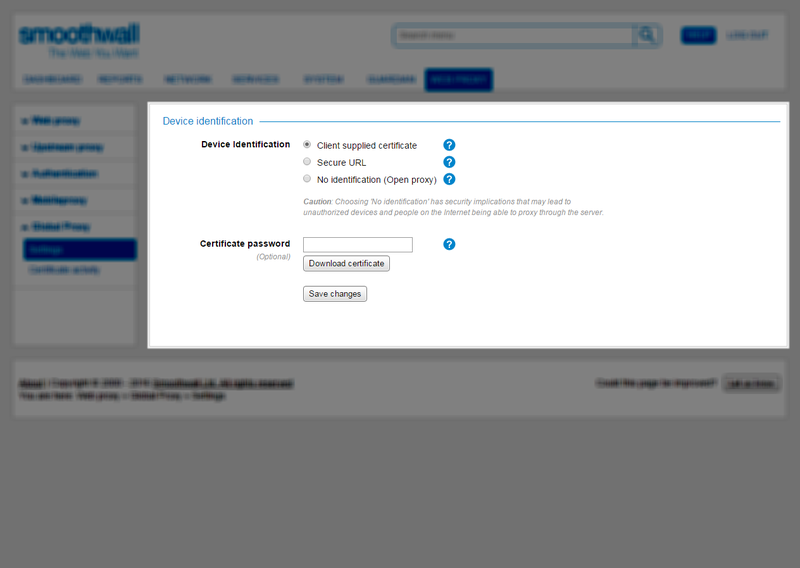 From Device identification, select Client supplied certificate. 6. Many client devices and applications require the device identification certificate to be password-protected, such as devices running iOS. Before downloading the certificate, you must set the password used. 9. Copy this certificate into the relevant devices' internal storage, and import it into the browsers. 3. Go to Web proxy > Global Proxy > Settings. 4. From Device identification, select Secure URL. 5. In the Query string text box that appears, enter the required string. 3. Go to Web proxy > Global Proxy > Settingss. 4. From Device identification, select No identification (Open proxy).